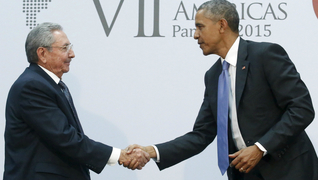 Obama and the Beginning of the End of the Cuban Embargo | Democracy Now! The failed United States policy against Cuba, which has for more than half a century stifled relations between these neighboring countries and inflicted generations of harm upon the Cuban people, may finally be collapsing. On Wednesday morning, we learned that Alan Gross, a U.S. government contractor convicted in Cuba for spying, had been released after five years in prison. Another person, an unnamed Cuban imprisoned in Cuba for 20 years for spying for the U.S., was also released. This has made global headlines. Less well explained in the U.S. media are the three Cubans released from U.S. prisons. They are the three remaining jailed members of the Cuban Five. The Cuban Five were arrested in the late 1990s on espionage charges. But they were not spying on the United States government. They were in Miami, infiltrating Cuban-American paramilitary groups based there that were dedicated to the violent overthrow of the Cuban government. It was President Dwight Eisenhower who severed relations with Cuba, on Jan. 3, 1961, two years after Fidel Castro took power. President John F. Kennedy then expanded the embargo. Months after Kennedy took office, the CIA invasion of the Bay of Pigs, intending to overthrow the government of Fidel Castro, went awry. It is universally considered one of the greatest military fiascos of the modern era. Scores were killed, and Cuba imprisoned more than 1,200 CIA mercenaries. Cuba became a flash point, most notably as the Soviet Union attempted to place short-range nuclear missiles on the island, precipitating the Cuban missile crisis in October 1962. This episode is widely considered the closest that nations have come to all-out nuclear war. The U.S. also tried to assassinate Castro. While the U.S. Senate’s Church Committee identified eight such attempts, Fabian Escalante, the former head of Cuban counterintelligence, uncovered at least 638 assassination attempts. The Cuban revolution has its critics, but the transformation of daily life there can’t be denied. Throughout the 1950s, under dictator Fulgencio Batista, most Cubans suffered in dire poverty, with scant access to education, health care or decent-paying jobs. The Batista regime was brutal, engaging in arbitrary arrests, torture and executions. Batista allied himself with the U.S. Mafia, personally profiting from widespread corruption, especially from the opulent hotels and casinos in Havana. Today, Cubans enjoy the same life expectancy as their neighbors in the U.S. and experience less infant mortality. Cuba has among the highest literacy rates in the world, surpassed only by Finland, Denmark, New Zealand and Australia, according to the United Nations Development Program, which ranks the United States as 21st globally, two notches above Kazakhstan. Cuba, often battered by hurricanes, has developed one of the best disaster-response medical systems in the world. They recently deployed 250 doctors to West Africa to combat Ebola. Then-President Fidel Castro offered to send 1,500 doctors to the U.S. in 2005, in the aftermath of Hurricane Katrina. The administration of George W. Bush did not respond. In 1976, an Air Cubana flight was blown up by terrorists. It exploded in midair, killing all 73 people on board. In 1997, hotels across Havana were bombed, with one Italian tourist killed. Former CIA operative Luis Posada Carriles took responsibility for the hotel bombings, and evidence strongly links him to the bombing of the airliner. The Cuban Five were guilty of investigating the terrorist activities of these men, and the nonprofit front groups that supported them, like the Cuban American National Foundation and Brothers to the Rescue. Posada Carriles currently lives in Florida, a free man. The Cold War is over. Cuba’s government is communist, but so are the governments of China and Vietnam, both of which have deep ties to the U.S. The 11 million people of Cuba, as well as all of us here, deserve an open connection as neighbors, based on equality, grounded in peace. Amy Goodman is the host of “Democracy Now!,” a daily international TV/radio news hour airing on more than 1,300 stations in North America. She is the co-author of “The Silenced Majority,” a New York Times best-seller. 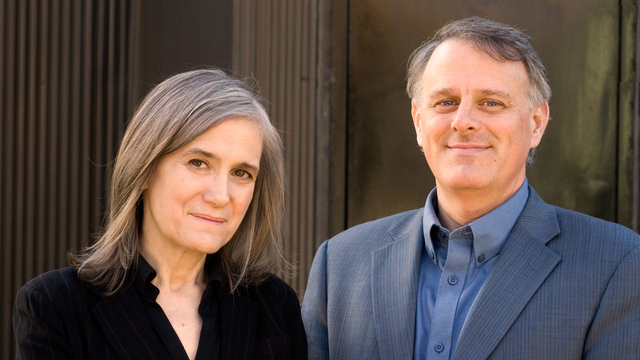 Click here to share and listen to to Amy Goodman’s weekly podcast. Subscribe to her podcast on SoundCloud and Stitcher Radio.